Use the free IDEAL AnyWARE app from IDEAL Networks to view send data cable and network test reports to colleagues and clients anywhere. The app connects to your IDEAL cable or network tester using Wi-Fi and transfers test reports to your mobile device. Once data is transferred, users can view the pdf reports and send them using their preferred file sharing method including email or file sharing app. Cable installers and IT technicians can share difficult problems with colleagues not located onsite to improve productivity and minimise downtime. Reports can also be sent to the client as soon as the job is complete demonstrating proof of performance. 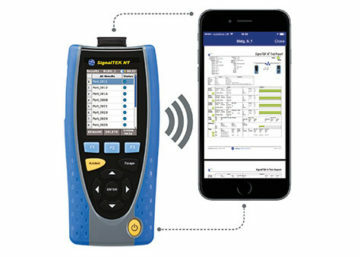 The hassle of connecting to local Wi-Fi is eliminated to provide a superior user experience because the IDEAL tester serves as Wi-Fi hotspot The IDEAL AnyWARE app is supported by SignalTEK CT, SignalTEK NT, NaviTEK NT, LanXPLORER Pro and LanTEK III. The LanTEK III is supported by the IDEAL AnyWARE app however PDF reports are not shown on the mobile device. The app is used to send test data to the office where PDF reports can be generated using the free IDEAL Data Center (IDC) management software. For instructions on how to use the app please refer to your IDEAL tester quick reference guide or manual.